Hibernian manager wants his Hibernian stars to show what they can do against the league leaders at Easter Road. New Hibernian manager Pat Fenlon wants his players to enjoy their lunchtime clash with Rangers at Easter Road. 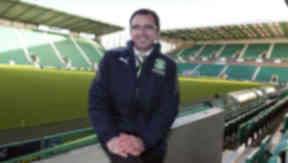 The Irishman will take charge of his first home game as boss of the Leith outfit when the SPL champions come to town. And after seeing his team’s game against Motherwell called off at half-time, Fenlon hopes his players will give a good account of themselves against Ally McCoist’s team. He said: “It’s a great opportunity for us to start at home with a big game and try and get something out of it. “You’ve got to go out and enjoy playing against Rangers, as a footballer in Scotland it doesn’t get much better than that. “We need to pick up a point, that’s why we are here. It doesn’t matter who the opposition is at the moment we’ve got to try and prepare the team as best as we can against every team. “We know we’re going to be in for a tough game, they are champions and they are a very, very good side. They’ve picked up some fantastic results over the past two or three years so we’re going to have our work cut out. Fenlon has broughtIarfhlaith Davoren in on trial but he has already been impressed with a number of players at the Edinburgh club. He said: “I think when we came in initially confidence was a little bit low and we tried to work on that in training. “The players have bought into that and showed good character in all the things we’re trying to do. They’ve taken a little bit of flak in the last while and that’s understandable considering the position we’re in.